It was very much worth my while. 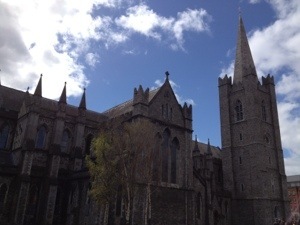 Though it was weird to be in church by choice having spent so much of my childhood trying to avoid going, and even more weird to realize when I got there that St. Patrick’s evidently hasn’t been Catholic since the Reformation, the art and architecture surrounding me were amazing. The choir was beyond impressive. And even the homily (is it called that in Anglican services? The way they did things was very close to what I remember from Mass, but it was also just a little bit off) was able to draw me in, mostly because it seemed weirdly, specifically relevant to my life. 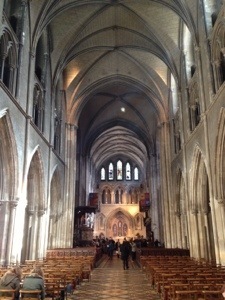 If you’re ever in Dublin, I’d highly recommend going to a service at St. Patrick’s. Even if you’re not religious in the least, it’s valuable for the cultural experience alone. And if you’re just a tiny bit inclined toward Christianity, it’ll probably be a nice spiritual experience as well. But fair warning: if you have any history as a Catholic, don’t expect to actually get in for free. You won’t pay the €5.50 entry fee, but your Catholic guilt will force you to throw a euro or two into the collection plate. Even if the place is, apparently, run by Protestants.